It’s amazing how technology has changed the way we communicate, meet people, and make friends. Not so very long ago many people couldn’t have fathomed meeting others via the internet and having them become some of your closest friends, but nowadays it can be a common occurrence. The food blogging world has introduced me to many people that are very dear to me, even if they aren’t physically near. One of these people is my friend Josie of Pink Parsley Catering. We have so much in common that sometimes we swear we must share a brain. 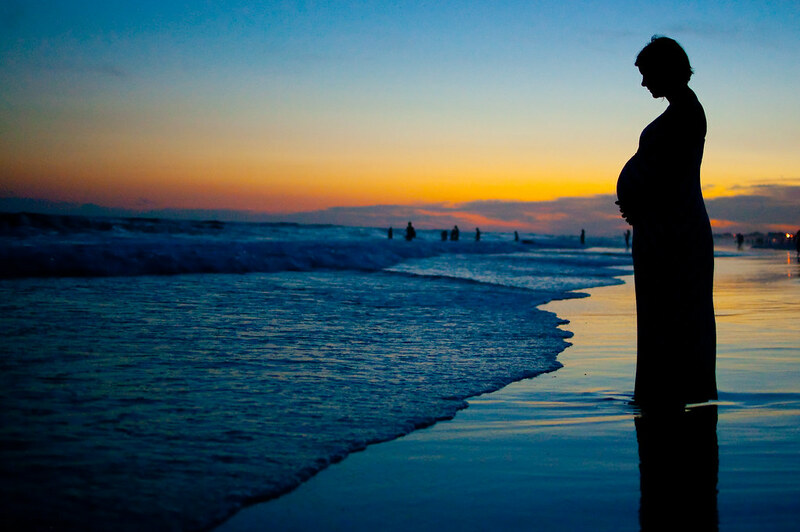 Josie (who also has a daughter named Caroline) is expecting her second baby next month – a boy this time! If we lived closer you can bet I’d be throwing her a real shower but since that’s not possible, we did the next best thing – a virtual shower! 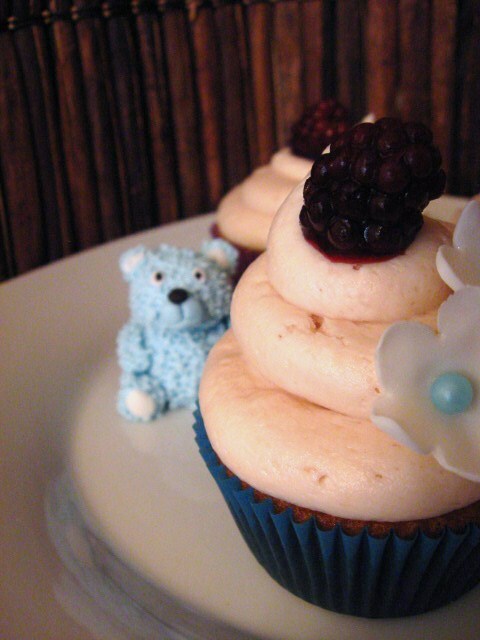 Lots of sweet and talented bloggers made dishes in honor of Josie and her little man. Everyone made such beautiful and thoughtful contributions. Pictures and descriptions of everyone’s dishes are included below. Be sure to check out their individual blogs to get the recipes and read more about their dishes. Every party needs a good cocktail, but in the case of baby showers, mocktails do just as well. Nikki of Pennies on a Platter mixed up this sparkling Italian lemonade. 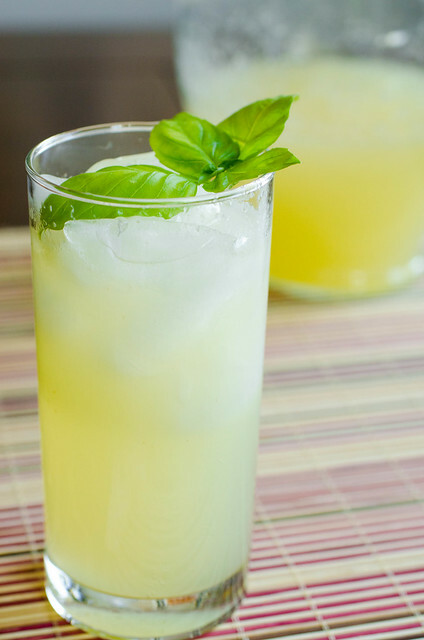 A little sweet, a little sour with an herbal note from the basil and bubbly from the sparkling water make this beverage appealing to just about everyone, pregnant or not! 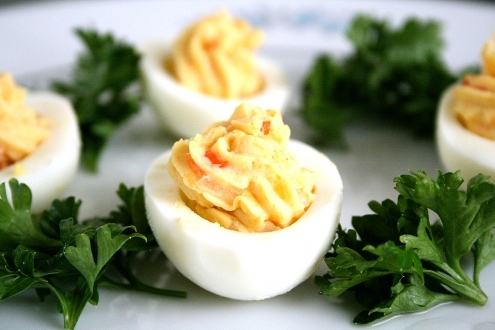 Brady of Branny Boils Over gave a southern spin to the classic deviled egg by adding pimento cheese to the filling. I am a major deviled egg lover and I know Josie adores pimento cheese, so this was a fantastic choice. Speaking of pimento cheese, Tara of Smells Like Home made fried pimento mac and cheese. There are so many great things going on in this dish, I can’t handle it. Mac and cheese? Pimento cheese? Fried? Sign me up. 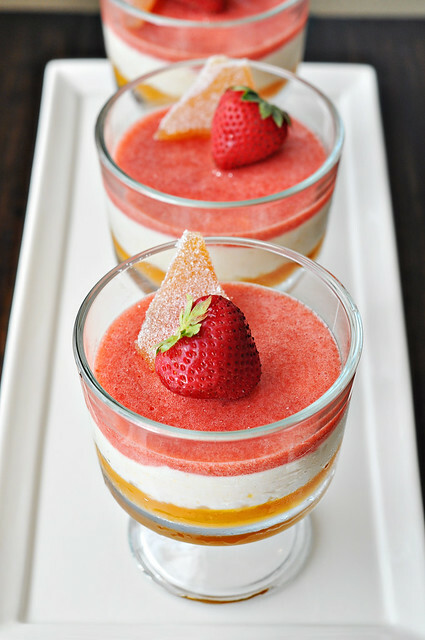 Courtney of Cook Like a Champion made these lovely layered peach and strawberry verrines. They include layers of peach gelatin, peach mousse, and strawberry puree. A light and fruity dessert like this is just perfect for any elegant shower, baby or bridal! 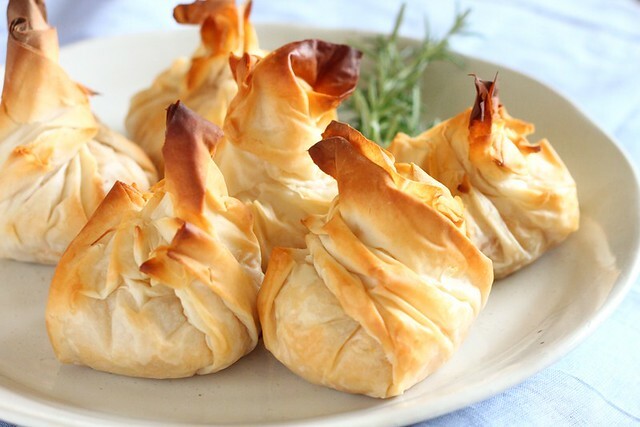 Cate of Cate’s World Kitchen made these gorgeous phyllo purses filled with goat cheese (pasteurized, of course! ), roasted apricots and rosemary. This sounds like a wonderful flavor combination, and goat cheese is a favorite of the mom-t0-be, so these would be a hit for sure. Elly of Elly Says Opa! 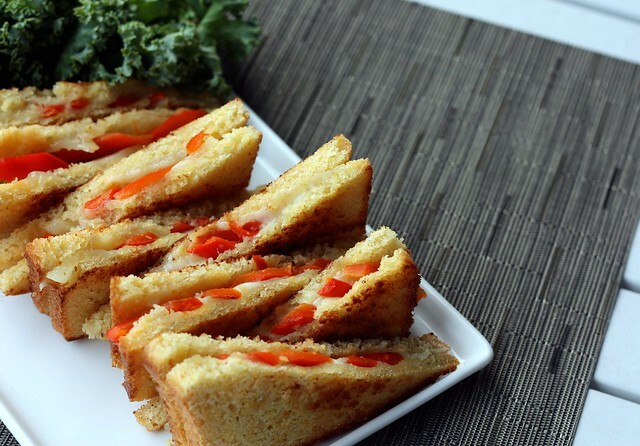 made these drool-worthy finger sandwiches with grilled piquillo peppers and manchengo cheese. And this isn’t just any bread – it’s yeasted cornbread. How great do these look? 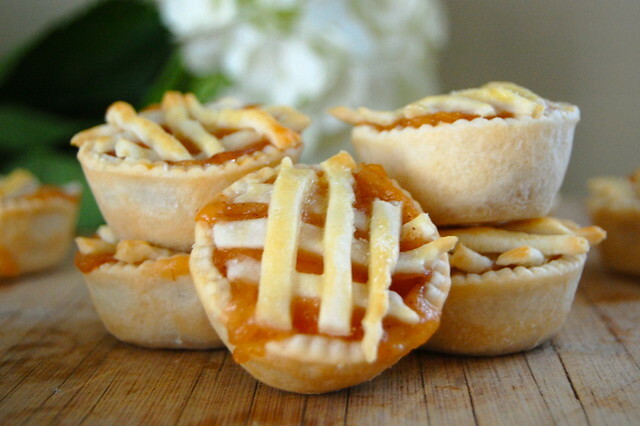 Michele of Cook Au Vin baked up some adorable baby peach pies. I love the idea of “baby” pies for a baby shower, and of course, peach pie is a great choice to honor this Southern mama. 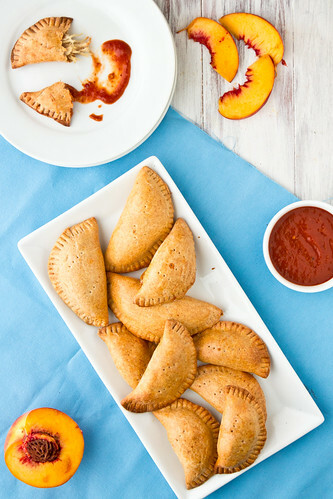 Shawnda of Confections of a Foodie Bride knows that Josie’s other favorite cuisine besides Southern is Mexican, so she contributed these pulled pork empanadas with peach chipotle BBQ sauce. Just based on the name alone, I can tell that is a lot of Josie’s favorite things rolled into one dish. Yum. 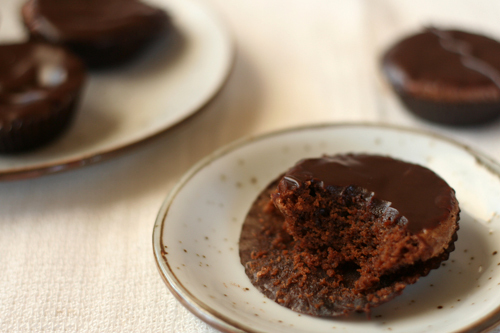 Bridget of The Way the Cookie Crumbles made chocolate friands. This dessert is new to me, but Bridget tells me they are like brownies so rich, they’re almost candy. Sold. 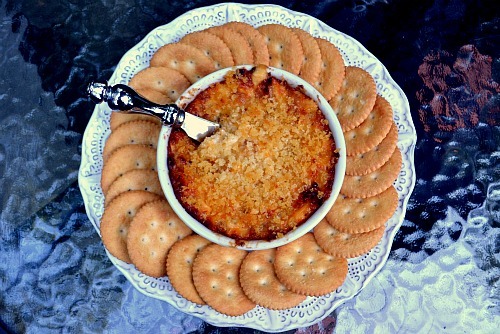 Jen of Bakin’ and Eggs made this baked vidalia onion dip. Onion dip is welcome at practically any party or get-together, and this upscale version looks ideal for a shower with lots of onions, warm melty cheese, and a crunchy bread crumb topping. My mouth is watering! 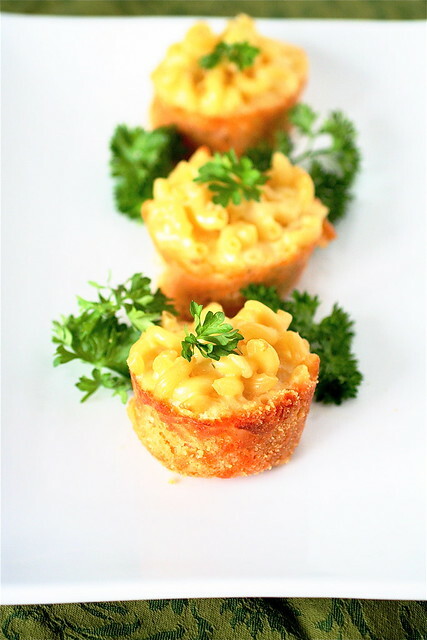 Shanon of The Curvy Carrot dished up these mini mac and cheese pies. Everyone loves mac and cheese, but it’s not exactly a party friendly food. 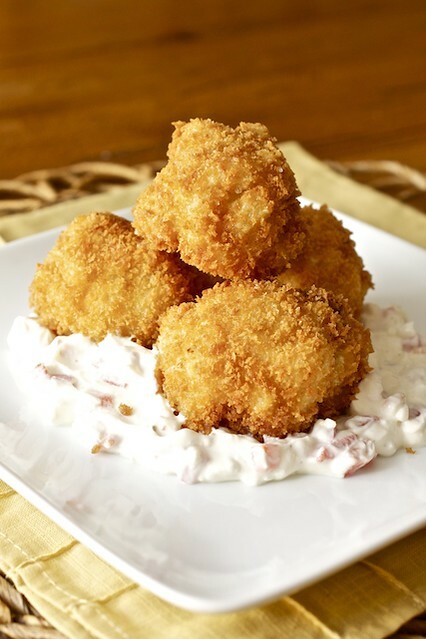 Serving mini-size portions in this neat little appetizer? Brilliant, I tell you. 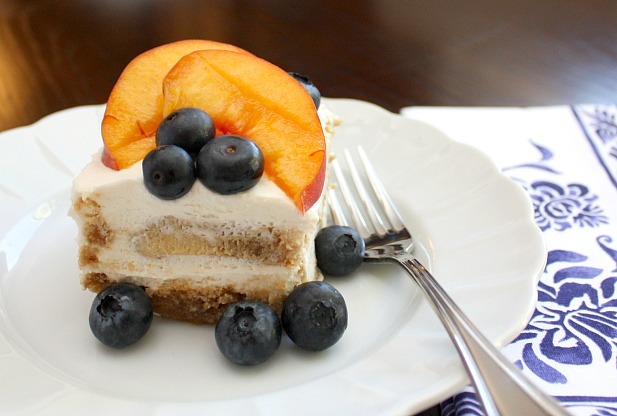 Kelsey of An Apple a Day made this incredible sweet tea tiramisu with peaches and blueberries. 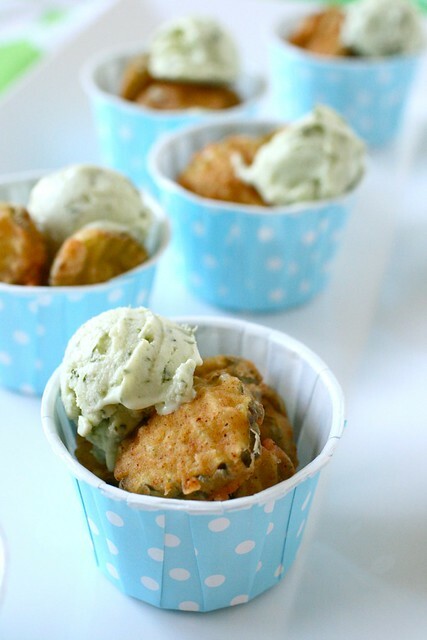 I know Josie is a major sweet tea lover so this is a perfectly elegant summery twist on a classic dessert. Because Josie and I have so much in common, I really agonized over what to make for her shower. I knew I wanted to make something Southern. I hemmed and hawed and eventually settled on fried pickles. I’ve been wanting to make them for a really long time so this seemed like a great opportunity. I was planning on just leaving it at that when suddenly I had a brain wave. Rather than serve them with the usual ranch dipping sauce, I decided to put a mini scoop of ranch ice cream on the side to make a play on the “pickles and ice cream” cliché of pregnancy. All I did was take my normal ranch dressing and put it in the ice cream maker to freeze. While this step certainly isn’t necessary, it added a fun touch to the presentation. If you have never tried a fried pickle, I highly recommend you change that ASAP. I know, they sound crazy and kind of gross – that’s what I thought before I had been enlightened – but believe me, they are good. They were also really quick to make. I know sometimes frying seems involved but thanks to the small size of the pickle slices, they were breaded quickly and I was able to fry them in my small saucepan so I didn’t need much oil. We really enjoyed this appetizer and I think Josie would too. Drain the pickles, reserving 2/3 cup of the pickle juice. Lay the pickle slices out on paper towels to blot off excess moisture. Combine the reserved pickle juice, egg, 1 tablespoon of flour, and hot sauce in a bowl. Whisk well to combine and set aside. In a shallow dish or pie plate, combine the remaining flour, cayenne, garlic powder, paprika and salt. Whisk to blend. In batches, dip the pickle slices in the egg mixture, gently shaking off the excess. Then dredge in the flour-spice blend. In a medium saucepan, add oil to about 1-inch depth. Heat the oil to 375˚ F. Fry the pickles in batches until golden-brown, about 3-4 minutes total. Transfer briefly to paper-towel lined rack. Serve warm with ranch dressing for dipping.